Or,if a berth holder, leave at reception and inform us. Sutton Marina: If a berth holder leave at reception and inform us. Or if a berth holder leave at reception and inform us. Plymouth Yacht Haven: Mountbatten Boathouse 01752 482666 Plymouth Yacht Brokers 01752 484176 Or if a berth holder leave at reception and inform us. Saltash: All Marine Engineering Services, Unit 10 Saltash Business Park, Forge Lane, Saltash PL12 6LX Tel.01752 847770 or 07973 693867 contact Alastair Flower. Or, if a berth holder leave at reception and contact us. Brixham Marina: Bayside Marine 01803 856771 If a berth holder leave at reception and inform us. Torquay Marina: If a berth holder leave at reception and inform us. Dartside Quay Galmpton: If a berth holder leave at reception and inform us. 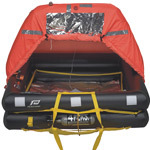 Bargain liferaft and Inflatable Boat prices !!! Liferaft Service - Now is the time !